What’s in the New US-ASEAN Maritime Exercise? The announcement of the forthcoming drills spotlighted Washington’s efforts to deepen defense ties with Southeast Asian states. Last week, we saw public confirmation that the United States and Southeast Asian states would look to hold a U.S.-ASEAN maritime exercise in 2019. While the idea is far from new, the timing was interesting, as it came just ahead of a similar exercise ASEAN countries are holding with China. The announcement spotlighted ongoing U.S. efforts to boost its military exercises with Southeast Asian states that are continuing under U.S. President Donald Trump. The United States has long had a string of multilateral exercises that it holds with Southeast Asian states, including the Cooperation Readiness and Afloat (CARAT) and the Southeast Asia Cooperation Training (SEACAT) exercises. But there have been efforts in recent years to boost the complexity of these drills as well as to further multilateralize them. Amid this growing multilateralization of U.S. exercises, one of the proposals that U.S. and Southeast Asian officials had been discussing over the past few years, including during the latter years of the Obama administration, has been the holding of a U.S-ASEAN maritime exercise. The indication last year was that the two sides would hold the exercise sometime in 2018. That would have put the exercise into the same timeframe as the first ASEAN-China Maritime Exercise, which has dominated headlines this year; the first phase was held in July in Singapore and the second phase is being held this week in China. But it had become clear subsequently that the U.S.-ASEAN exercise would probably occur only in 2019. Last week, we got some further public confirmation that a U.S.-ASEAN maritime exercise was still being considered for 2019. The confirmation came in the context of the most recent iteration of the ASEAN-U.S. Defense Ministers’ Informal Meeting between U.S. Defense Secretary James Mattis and the 10 Southeast Asian defense ministers, which took place in Singapore on the sidelines of the 12th ASEAN Defense Ministers’ Meeting (ADMM) and the 5th ADMM-Plus. While Mattis and the ASEAN ministers discussed a range of issues during their October 19 meeting– including U.S.-China relations, ASEAN’s role in regional security, and priority areas for U.S.-ASEAN security cooperation such as maritime security and counterterrorism – the focus was on the confirmation of the holding of the ASEAN-U.S. Maritime Exercise in 2019. According to Singapore’s defense ministry (MINDEF), Mattis and Singapore’s Defense Minister Ng Eng Hen welcomed the exercise as a useful confidence-building measure that would build the capacity of regional navies and enhance the cooperation between them. 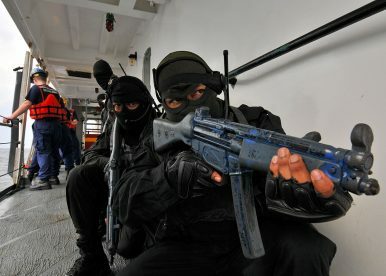 Official accounts of the meeting said that the exercise is set to be held in conjunction with the U.S. SEACAT exercise. That is no surprise – as seasoned observers of U.S. defense policy know, SEACAT has long served as an avenue for Washington to shape proposals for strategic as well as opportunistic expansions of exercises, whether it be in terms of partners involved, areas covered, or specific activities conducted as part of the drills. No further details were publicly issued regarding the ASEAN-U.S. Maritime Exercise, including the specific timing and the exact extent of participation from the United States and Southeast Asian states. As we move closer to the holding of the actual exercise, such details will be important to watch as markers for the broader significance of the exercise as well as how it fits into broader domestic and regional developments. A closer look at the ongoing activity within the annual SEACAT exercise and its significance.